Leakage current results when the gap between two metal electrodes narrows to the point that electrons are no longer contained by their barriers, a phenomenon known as quantum mechanical tunnelling. As the gap continues to decrease, this tunnelling conduction increases at an exponentially higher rate, rendering further miniaturization extremely challenging. Scientific consensus has long held that vacuum barriers represent the most effective means to curtail tunnelling, making them the best overall option for insulating transistors. However, even vacuum barriers can allow for some leakage due to quantum tunnelling. In a highly interdisciplinary collaboration, researchers across Columbia Engineering, Columbia University Department of Chemistry, Shanghai Normal University, and the University of Copenhagen have upended conventional wisdom, synthesizing the first molecule capable of insulating at the nanometer scale more effectively than a vacuum barrier. Their findings are published online in Nature ("Comprehensive suppression of single-molecule conductance using destructive δ-interference"). “We’ve reached the point where it’s critical for researchers to develop creative solutions for redesigning insulators. Our molecular strategy represents a new design principle for classic devices, with the potential to support continued miniaturization in the near term,” said Columbia Engineering physicist and co-author Latha Venkataraman, who heads the lab where researcher Haixing Li conducted the project’s experimental work. Molecular synthesis was carried out in the Colin Nuckolls Lab at Columbia’s Department of Chemistry, in partnership with Shengxiong Xiao at Shanghai Normal University. The team’s insight was to exploit the wave nature of electrons. By designing an extremely rigid silicon-based molecule under 1 nm in length that exhibited comprehensive destructive interference signatures, they devised a novel technique for blocking tunnelling conduction at the nanoscale. Destructive quantum interference occurs when the peaks and valleys of two waves are placed exactly out of phase, annulling oscillation. Electronic waves can be thought of as analogous to sound waves—flowing through barriers just as sound waves “leak” through walls. The unique properties exhibited by the team’s synthetic molecule mitigated tunneling without requiring, in this analogy, a thicker wall. Their silicon-based strategy also presents a potentially more factory-ready solution. While recent research into carbon nanotubes holds promise for industrial applications over the next decade or so, this insulator—compatible with current industry standards—could be more readily implemented. 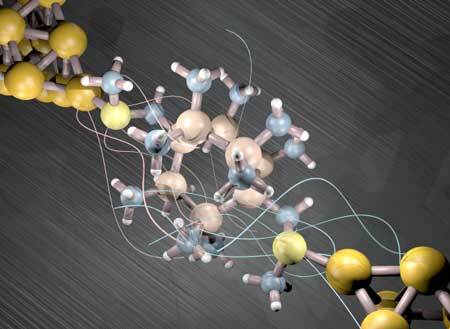 This breakthrough grew out of the team’s larger project on silicon-based molecule electronics, begun in 2010. The group arrived at their latest discovery by bucking the trend. Most research in this field aims to create highly conducting molecules, as low conductance is rarely considered a desirable property in electronics. Yet insulating components may actually prove to be of greater value to future optimization of transistors, due to the inherent energy inefficiencies caused by leakage currents in smaller devices. As a result, their work has yielded new understanding of the fundamental underlying mechanisms of conduction and insulation in molecular scale devices. The researchers will build on this insight by next clarifying the details of structure-function relationships in silicon-based molecular components.